E-COMMERCE is a big deal in China and is helping new retailers in the country get the attention of customers. It’s why all of the major brands such as L’Oréal, P&G, Colgate-Palmolive, and so many others have collaborated with Chinese e-commerce giant Alibaba to make sure they have a finger on the pulse of the market and are able to maximise sales for their brand. According to a recent eMarketer report, e-commerce growth in China this year is expected to be in excess of 30 percent, creating sales worth US$1.99 trillion. SEE ALSO: Malls are so 2018: Are the days of bricks-and-mortar retail finally over? Compared to the overall retail sales estimate of US$5.636 trillion this year, e-commerce contributes to 35.3 percent of retail sales in the country. eMarketer’s analysts believe that is the highest number in any of the markets across the world. In fact, e-commerce growth seems to be why the country’s retail industry will surpass the US for the first time this year, and is expected to continue that streak for years to come. According to eMarketer, the US lags far behind in terms of online sales. E-commerce only represents 10.9 percent of retail sales in the US. China surpassed the US in e-commerce sales way back in 2013, and by the end of this year, the country will have 55.8 percent of all online retail sales globally, with that figure expected to exceed 63 percent by 2022. Further, according to eMarketer, the US’s share of the global e-commerce market is expected to drop to 15 percent by 2022. This year, China’s retail sales this year will surpass that of the US by more than US$100 billion. However, the biggest growth will be in the e-commerce sector in the country — which has been growing in leaps and bounds over the past few years. Alibaba will lead e-commerce sales in China with a 53.3 percent share, and although it seems like a mammoth in the country, the reality is that its share has been steadily declining for the past several years. 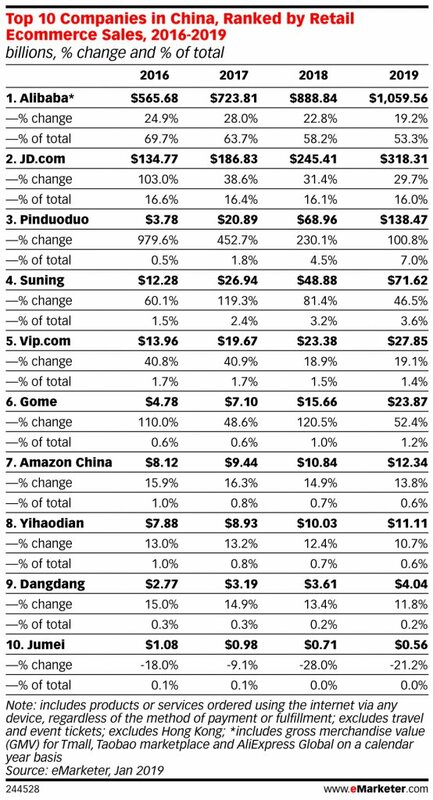 It seems as though smaller players such as Pinduoduo and Suning are chipping away at the e-commerce giant’s dominance. Pinduoduo, for example, has seen triple-digit growth since 2016, and although its share remains small, the company has made headlines in the country and beyond in the past year. eMarketing Senior Forecasting Director Monica Pert acknowledged that the growth in retail in China is a direct result of residents experienced rising incomes, catapulting millions into the new middle class — which has enabled a marked rise in purchasing power and average spending per person. However, the truth is, with digital gaining momentum in China, e-commerce platforms are redefining how customers buy, with video content, group sales, and much more. The future of the industry in China is definitely set to get even more exciting with new-age technologies such as artificial intelligence and the internet of things, often dubbed as game changers for retail, making a bigger impact on the ground.